Figure 1. This 0.51 ct Paraíba tourmaline from Brazil displays sharp chatoyancy. Photo by Nuttapol Kitdee. A vivid shade of tourmaline varying from “neon” blue to greenish blue, caused by copper and manganese, was discovered in Brazil in the 1980s. Recognized as “Paraíba” tourmaline in the gem trade, it is still highly sought after, even though tourmalines exhibiting this “Paraíba” color are now more accessible from localities such as Nigeria and Mozambique. Recently, GIA’s Bangkok laboratory received a vivid blue tourmaline with chatoyancy (figure 1), weighing 0.51 ct and measuring 5.89 × 4.19 × 2.46 mm. Standard gemological testing resulted in a spot refractive index reading of 1.64 and a specific gravity of 3.05. Microscopic examination revealed diagnostic irregular two-phase inclusions, trichites, and acicular (needle-like) features. The sharp cat’s-eye effect was caused by an included layer of fine parallel growth tubes positioned just above the base of the cabochon. The phenomenon of chatoyancy enhances its rarity and value. Laser ablation–inductively coupled plasma–mass spectrometry (LA-ICP-MS) was used to perform an elemental analysis. The sample showed high Cu ranging from 7289 to 10544 ppmw, as well as 9494–10441 ppmw Mn, 114–133 ppmw Ga, 55–65 ppmw Pb, 39–48 ppmw Fe, 14–20 ppmw Zn, and 0.6–0.5 ppmw Sr. The very high concentration of Cu as well as the results for Ga (<250 ppmw), Pb (<100 ppmw), and Sr (<10 ppmw) supported its Brazilian origin (J.E. Shigley et al., “An update on ‘Paraíba’ tourmaline from Brazil,” Winter 2001 G&G, pp. 260–267; A. Abduriyim et al., “Paraíba-type copper-bearing tourmaline from Brazil, Nigeria, and Mozambique: Chemical fingerprinting by LA-ICP-MS,” Spring 2006 G&G, pp. 4–21; Z. Sun et al., “A simplified species classification for gem-quality tourmaline by LA-ICP-MS,” submitted for publication). Copper-bearing tourmaline of this color is typically referred to in the trade as “Paraíba” tourmaline. 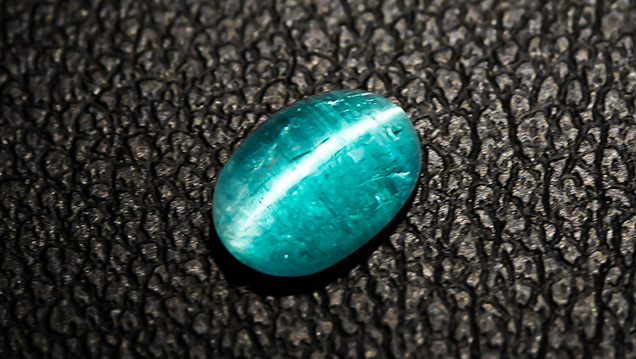 Cat’s-eye Paraíba tourmaline is not new, though fewer than 10 have been submitted to GIA laboratories. The combination of well-developed chatoyancy, transparency, pleasing vivid blue color, and Brazilian origin make this a rare and noteworthy gemstone. Vararut Weeramongkhonlert is a staff gemologist at GIA in Bangkok. Vivid blue, green, and purple-to-violet cuprian elbaites, renowned in the gem trade as “Paraíba” tourmalines, continue to be recovered in small amounts from northeastern Brazil. Gem-quality bright blue to green “Paraíba”-type Cu-bearing tourmaline is now known from deposits in Africa (Nigeria and Mozambique), in addition to three commercial localities in Brazil (in Paraíba and Rio Grande do Norte States).